On the final stage of Battle Princess Madelyn, I needed a break. There were a series of jumps I just couldn’t master, and I fell to my death more times than I could count. I knew I was getting angry, so I put the game down and allowed myself to cool off for a week before picking it back up again. I made one more attempt at the level and immediately got annoyed again, so that’s as far as I went. Is a game bad because of its difficulty level? 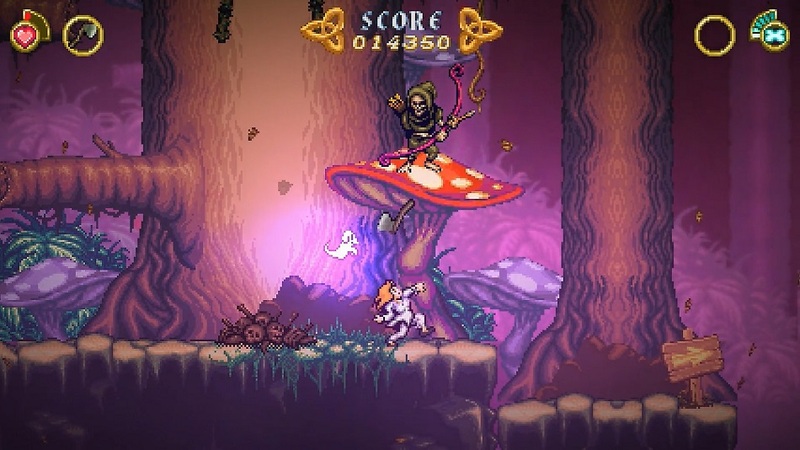 Not necessarily, but what hurts the most with Battle Princess Madelyn are all the little ways it sapped my spirit, despite being charmed by the gorgeous backgrounds, diverse enemies, and delightful characters. Madelyn starts with a wonderful homage to The Princess Bride and a moving cutscene where Madelyn’s faithful dog, Fritzy, sacrifices himself to protect his master for not the last time — he remains by her side in spirit form. Together, Madelyn and Fritzy must defend their homeland and the very world itself from an evil sorcerer bent on conquest. Along the way, they meet a colorful cast of friends and foes, engage in witty and well-written banter, and perform a staggering number of seemingly unrelated fetch quests. 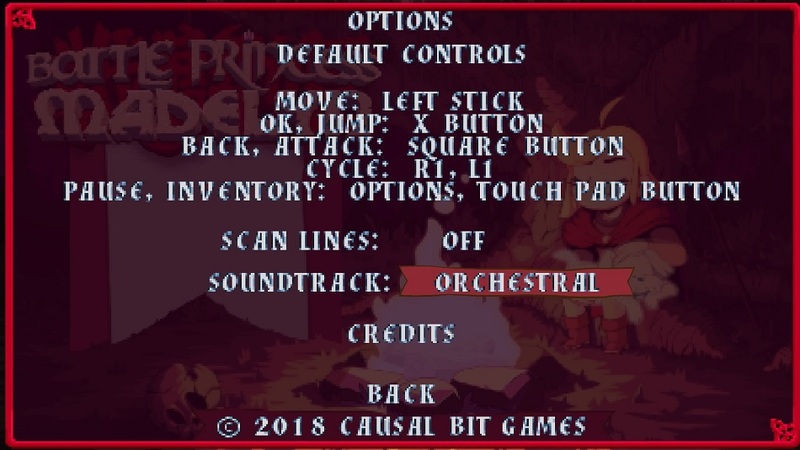 Battle Princess Madelyn is a 2D action platformer/exploration hybrid with fairly standard controls — the thumbstick moves the character, jump is X, attack is square. As Madelyn progresses, she earns new weapons which can be cycled with the L1 and R1 buttons, each with different attack patterns, power levels and animations, so some care is needed in deciding which weapons should be used in certain situations. For instance, the dagger’s spinning motion is better at striking an enemy’s hitbox from slightly above or below, making it ideal for taking down enemy archers from the safety of a nearby ladder, while the magic wand grants Madelyn the ability to bounce off of enemies pogo-style, necessary in later levels. 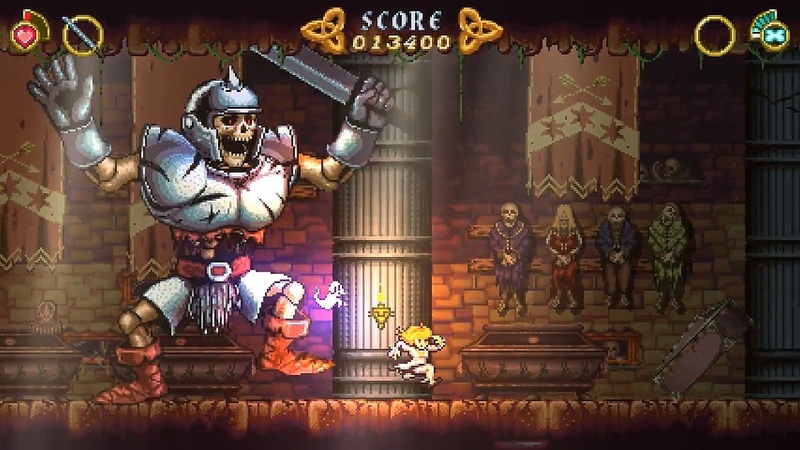 This strategizing with weapons is vital as Madelyn faces a surprising number of unique enemies. Skeletons wearing different layers of armor (including their own coffins!) pop up while bats race overhead trying to knock Maddie off precariously-placed platforms. Enormous serpents curl around the very posts she needs to access while even more skeletons pepper her with arrows. Bosses range from giant spiders to mechanical rabbits, each requiring unique methods for victory. Most innovative are the mechanics involving Fritzy. The ghost-pup gains new powers such as firing protoplasmic projectiles or consuming smaller enemies whole. The animations for his various powers are spectacular, especially when he becomes a diving helmet for Maddie during an underwater level. To prevent our canine companion from becoming completely overpowered, he consumes the magic energy that also keeps Madelyn alive via a poorly-explained life meter. If Madelyn is killed, Fritzy can revive her on the spot, provided he has enough energy gained by defeating enemies to do so. If not, Madelyn dies and must restart at a save point. While there are certainly differences, BPM wears its Ghosts N’ Goblins influence on its sleeve. Madelyn’s animations pay tribute to Arthur’s quest with each step, and she also sheds her armor when she takes damage — just like her ’80s forebear. It also pays tribute to the former’s incredible challenge, but not in a good way. In fact, Madelyn stops being enjoyable almost immediately after it lures players in with its charms. Vague arrows appear occasionally to point our heroine in the direction of her main questline, but there are no similar icons helping her fulfill numerous secondary tasks asked of her by random denizens. What results is a lot of backtracking and guesswork as the player tries to remember which villager asked for which difficult-to-find MacGuffin that may or may not be critical to the main storyline. I was stuck for an hour trying to determine why I couldn’t open a boss gate — it turned out the key was the reward for a completely unrelated side quest in a separate area that required a fair bit of exploration in yet another unrelated stage to accomplish. I like the idea of making the most of the world, but the sheer amount of backpedaling and memorization required is a turn-off. To alleviate this somewhat, there’s an arcade mode that eliminates the plot and exploration in favor of straightforward platforming, bringing the game closer to it’s Ghosts N’ Goblins influences. The stages play as a remixed version of the levels in the story mode, complete with added special effects and different platforming elements — things like additional jumps over trickier terrain, new enemies, and old enemies with new attacks. 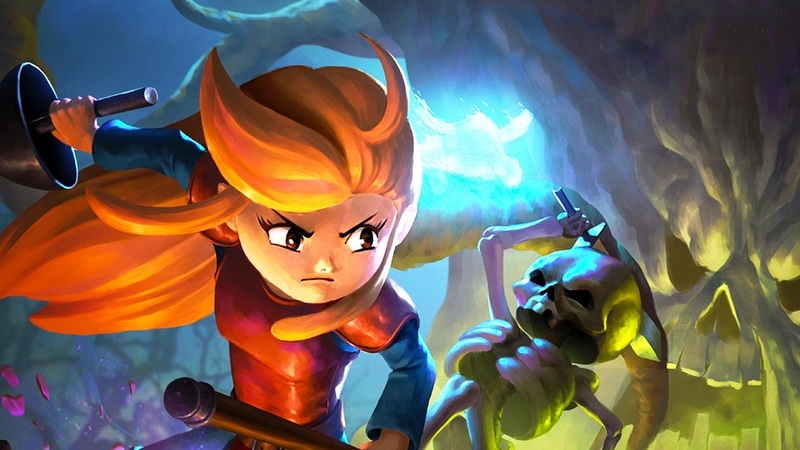 Mechanically, Madelyn is intriguing, but the pixel-perfect platforming required means that she’s going to meet an untimely demise far more often than I’d like. Infrequent save points mean having to re-conquer already-difficult sections, enemies cause a horrendous amount of knockback, and archers fire in continuous volleys requiring pinpoint precision on jump attacks. Glitches such as disappearing enemies (who then can’t be bounced on to cross wide gaps) or animation failures causing Madelyn to become stuck in the ground also add to the irritation factor. Disclosures: This game is developed by Casual Bit Games Inc. and published by Casual Bit Games Inc. and Hound Picked Games. It is currently available on PC, PS4, PS Vita, Wii U, and Xbox One. This copy of the game was obtained via publisher and reviewed on the PS4. Approximately 12 hours of play were devoted to the single-player mode, and the game was not completed. There are no multiplayer modes. Parents: According to the ESRB, this game is rated E and contains Mild Fantasy Violence. The game is basically safe for kids. There is cartoon violence, and enemies are of an occult nature (skeletons, tree monsters, etc.) which may be unsettling for younger children. A dog is killed and returns as a ghost as an unskippable plot point, which may also be upsetting to the younger set.. Deaf & Hard of Hearing Gamers: All dialogue is in subtitle form, only, so all story elements are completely accessible. Successful hits on enemies register as a clacking sound with a slight visual cue. However, striking background elements (rocks, platforms, etc.) also show this same visual cue. It is therefore possible not to be able to determine if attacks are actually hitting enemies. It is not possible to resize fonts for dialogue, nor are there alternate font color choices. Jeff Ortloff has been around since the birth of the console era.He’s played everything from Pong to Marvel’s Spider-Man with a near-inhuman lack of skill.He’s been writing about games since about 2007, and is thrilled to be part of the GameCritics.com team. He juggles this passion for gaming with his most important job, being a husband and dad.Fortunately, his boys are growing up as gamers (with decidedly more skill, much to his annoyance) and he has a very understanding spouse. He hangs out on Twitter sometimes as @JPSJeffOrt, Facebook FAR less frequently, and while he misses performing all the interviews from his former online life, he’s much more relaxed now!